Counting my last two years of college, I’ve worked 37.5 years of the last 39 years of work life in destination marketing organizations. But that doesn’t mean my career hasn’t changed. There have been at least seven transformations during that span. And each has been intense. Initially, I was hired by a Chamber of Commerce which had activated a CVB as a department. But shortly thereafter, I was given the task of separating the CVB into a stand-alone organization. Until the late ‘60’s and early ‘70’s, some CVB’s evolved first as an incubator within a Chamber. But today, less than 5 in every 100 are still part of a Chamber, mostly in small towns. Today, most DMO’s, similar to DCVB, are chartered from the get-go as stand alone. Until the 1970’s, many DMO’s focused only on convention visitation I think because it was easier. Then came the realization that focusing on just 10-11% of all visitors didn’t really make sense. First, because many destinations have other core attributes and cultural identities that appeal not only to conventions but segments with much larger potential. Second, because destinations learned that to attract convention planners a community also had to be a good visitor destination overall. 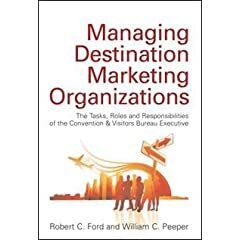 I was lucky to be on the forefront of a shift in DMO’s from being organizations that did marketing by emulating other communities to organizations that made destination specific decisions on product and marketing strategies based on information and research. You still find DMO’s that are emulation driven but they are anachronistic. Then DMO’s evolved to being visitor centric community marketing agencies rather than organizations that marketed to draw tourism as a means to fuel tourism related businesses. You still hear the term “heads in beds” but very rarely. Communities came to realize that tourism is a means to achieve much greater ends including generating local tax revenue, personal income and value added to the economy overall and that fueling narrow types of businesses was a byproduct. Before coming to Durham, I had worked in non-profit DMO’s that were membership driven advocacy organizations contracting to do tourism marketing. But North Carolina had shifted to a farsighted approach of chartering DMO’s as tourism development authorities. Much more practical, effective, transparent and accountable, but also less likely to be hijacked by special interests. DMO’s I have managed began using computers to accelerate productivity as early as the early to mid-1980’s but the Internet explosion in the mid ‘1990’s revolutionized destination marketing once again. Instead of banking information and distributing it, DMO’s became gatekeepers on the web as the authentic and official source of information on their communities. DMO’s have also shifted from developing tourism for communities to developing communities as destinations worthy of a “visitor’s deep engagement and a resident’s love.” “Developing a community into “some place in particular, with its own character and charisma” to paraphrase Dr. Russell Scott Sanders. So the career that chose me is destination marketing but it has always been an evolving ride.